Tickford was founded in 1820 as a company that produced horse-drawn coaches. In 1923, Tickford began producing motor vehicles. In the mid 1950's Tickford was melded into a new company that included Aston Martin. Today, Tickford vehicles are produced in the Australian market under a joint-venture agreement with Ford. The vehicle featured in GT3 is the Falcon XR8 Race Car, which is sponsored by Ford Tickford Racing in Australia's Super car circuit. The team for 2001 comprises two drivers: lead driver Glenn Seton (who is also the team's managing director) and Steven Richards. 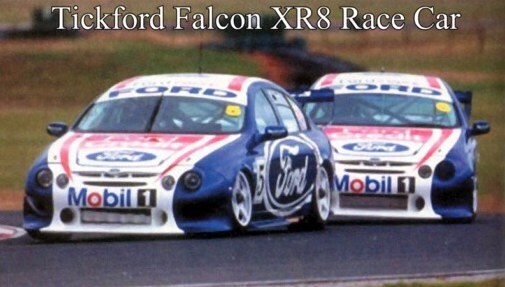 One car represents the Tickford name - the racecar that competes in Australia's V8 Super car circuit, the Falcon XR8 Race Car.